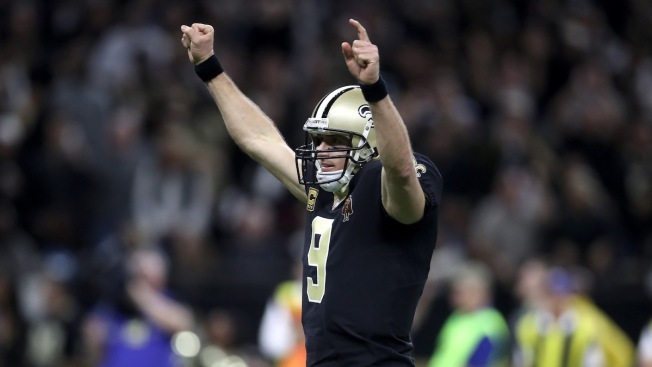 Quarterback Drew Brees of the New Orleans Saints reacts after throwing a touchdown pass against the Carolina Panthers at the Mercedes-Benz Superdome on Jan. 7, 2018, in New Orleans. Yahoo Sports will livestream all four divisional playoff games this weekend and the conference championships as an appetizer for next season when every game from the preseason to the Super Bowl will be livestreamed on its sports app. Watching NFL games on your phone used to be mainly limited to Verizon customers but that changed now that Verizon owns Yahoo. So, now anyone is able to watch football games on the go for free on Yahoo's app regardless of mobile network. Fans have to download the Yahoo Sports app on iOS or Google Play and enable location services on their phone. Saturday's games are the Falcons-Eagles at 4:35 p.m. EST and Titans-Patriots at 8:15 p.m. Sunday's games are at 1:05 p.m. (Jaguars-Steelers) and 4:40 p.m. (Saints-Vikings). Eagles fans took to the streets of Philadelphia to celebrate their team's stunning victory over the New England Patriots in Super Bowl LII. Yahoo Sports also will livestream the conference championships Jan. 21 and the Pro Bowl on Jan. 28. Beginning next season, users will be able to stream in-market and national NFL games, including preseason, regular season, playoff games and the Super Bowl on the Yahoo Sports app regardless of mobile network.